Paradoxology: Crucifix: Symbol of Power or Powerlessnes? 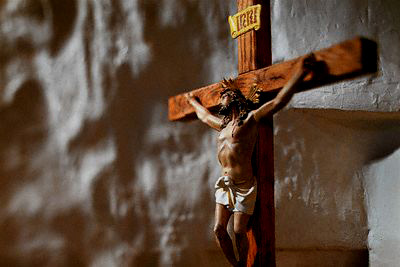 During a recent conversation, a prominent seminary professor made to me what seemed to be an outlandish claim: that the many problems plaguing the Roman Catholic Church could be traced back to their use of the crucifix -- a symbol of a powerless Christ for a powerless church. Such rhetoric was shocking to me -- the likes of which I haven't encountered since the Catholic-bashing that was common among evangelicals during the 70's and 80's. My personal view concerning the crucifix and it's appropriateness is certainly different. Although I concede that the message conveyed by an empty cross (i.e.post-resurrection) is powerful and important, evangelicals have long distanced themselves from the suffering and cost inextricably connected to the cross of Christ. The crucifix therefore represents a helpful corrective in this sense. Apart from this, I have noticed in recent years, a growing appreciation among evangelical believers for the crucifix. It's as if they recognize that Protestant representations of Jesus have lacked something that the image of our crucified Savior seems to fill-in. I'd love hearing your thoughts on this topic. Is the crucifix a powerful and helpful symbol of our faith? Or is my professor friend correct in asserting that the image of the crucifix amounts to a clever ploy of the Enemy -- one designed to keep an enormous segment of the Church relatively powerless? I don't totally agree with your conclusions but you've given me something to chew on, for sure. The Puritans rejected the crucifix as a symbol but were very heavily into remembering the suffering (and incidentally encouraging their members to feel the suffering as well). There are a number of Christian churches that emphasize the cross as a crucifix even though they do not physically have a crucifix on the premises. For them, the Good Friday suffering is the key element. For some churches, however, the suffering is part of the whole picture (an important part) but the focus is on the resurrection, the empty cross that cannot hold the power of God on its crossbeams. The empty cross can stand for joy -- and when you spend too much time looking at the crucifix it's possible to forget the joy that comes with Easter. Neither symbol can really stand all on its own without the other. But it is where the focus is, whether on the blood sacrifice view or the empty cross promise, is the choice a Christian has to make for him/herself. Hopefully they will be seen as two very important symbols that msut be seen in tandem. I think that part of the problem stems from the issue of the "empty cross vs. crucifix" is that we look at these two options as battling for supremacy as THE symbol for our faith. Neither, in my opinion, are sufficient for over arching symbols of Christianity. Therefore, once we see them both as being two among many symbols of faith, I think we are better ready to explore your question. That being said, the crucifix has always been a powerful reminder to me that our emphasis is not upon the instrument of crucifixion, but upon Christ who died upon it. It demands that we pull our faith outside of purely symbolic abstraction to encounter the stark reality of the Passion. Additionally, it reminds us that His suffering and death are not merely historical events of spiritual significance, but rather immediately connected to the life we live every moment (Hebrews 6:4-6). While I do not advocate the guilt-ridden legalism that is all to prevalent in the Church today, I do believe that by avoiding the suffering & death of Christ, as depicted to simply and universally in the crucifix, we have lost a great deal of what it means to "fear God". To that end, I believe that both the empty cross and the image bearing the broken Body of Jesus are equally essential symbols of faith. "But we preach Christ crucified, unto the Jews a stumblingblock, and unto the Greeks foolishness;" (I Cor. 1:23) So I'm not surprized folk are still 'stumbling' over this! Folk should remember it was not the Resurrection, but in His death on the Cross that Christ was victorious! "Folk should remember it was not the Resurrection, but in His death on the Cross that Christ was victorious!" I have a difficult time with this statement. To me the two cannot be so easily separated. The death without the resurrection would have been useless and the resurrection without such a death would have been impotent. And all that to ignore the power of his birth and life!!! One of the reasons (and there are many) that I do embrace the empty cross or the crucifix as the ultimate symbol of faith is that it is not adequately Trinitarian. Yes, we do preach Christ crucified, but we also preach the freedom, restoration, forgiveness etc. that the rest of the Word teaches us. However, I do believe it is ONE central symbol, and an important one at that. However, I am unconvinced that we should even TRY to have a singularly central symbol of our faith. Did I just use "however" twice in a two sentenced paragraph? Yikes! Now, I don't think that the Resurrection is un-important. But it was Christ Death that was the Main Act of His life. One of the reasons (and there are many) that I do embrace the empty cross or the crucifix as the ultimate symbol of faith is that it is not adequately Trinitarian. You are giving me food for thought. However, I am not sure that I agree with you here. If in Christ the Godhead dwelled Bodily, and at the Death of the Son, God turned His face away... I think we can 'argue' for the presence of the Trinity here, just as much as at the Baptism in the Jordan. Great start to a fascinating discussion, everyone! "The empty cross can stand for joy -- and when you spend too much time looking at the crucifix it's possible to forget the joy that comes with Easter." "Hopefully they will be seen as two very important symbols that must be seen in tandem." " the crucifix has always been a powerful reminder to me that our emphasis is not upon the instrument of crucifixion, but upon Christ who died upon it." I was entrigued by the connection you were making between the suffering and death of Christ -- and our understanding of the "fear of God." Could you expound just a bit more on that? It sounds very interesting. "I think the Crucifix is the supreme Christian Symbol." Seraphim, do our Orthodox brethren embrace both symbols equally, or one over the other? "If Jesus made a public spectacle of Satan and his forces on the cross and through the cross He triumphed over them, is it any wonder that satan desperately wants to discredit the cross? " And so, what do you think -- is the scholar I mentioned an unknowing instument of Satan, by means of his criticism for the crucifix?